Serve mixed greens as a side or add them to soups and casseroles. A steaming pot of mixed greens provides a flavorful side dish with a nutritional punch. Kale, collards and turnip and mustard greens are just a few of the sturdy greens that work well in cooked dishes. 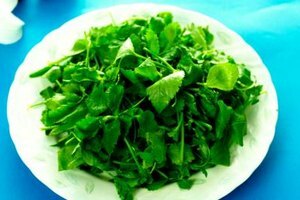 Boiling, the common method for cooking greens, leaches out any residual bitterness and results in tender vegetables. Avoid wilted, damaged or slimy greens and select only healthy green ones to ensure the best flavor and quality after cooking. Fill the sink or a bowl with cold water. Hold the greens by their stems and dunk the leaves into the water. Swirl the leaves around to rinse out any soil or grit, and then shake off the water. Cut off any tough stems or damaged leaf parts with a sharp knife. Fill a pot with 1 quart of cooking liquid for every 2 pounds of greens, such as water, meat broth or vegetable broth. Add your preferred seasonings, including salt and pepper. Cubed salt pork or small pieces of bacon can also add flavor to the cooking liquid and the greens. Stir the greens into the liquid. Bring the water to a boil. Lower the heat and cover the pot, allowing the greens to simmer in the liquid for about 45 minutes. Drain the greens in a colander or remove them from the cooking liquid with a slotted spoon. Add additional seasonings to taste, if desired. Young, tender greens may require a shorter cooking time compared to tough, older leaves. You can also steam tender greens for five minutes or until they just begin to wilt. Save the cooking liquid from greens and use it in place of vegetable broth in other recipes.